A High ranking cleric and the Supreme Leader’s representative in Khorasan province of Iran thanked Iraqi prime minister Nouri al-Maliki for the massacre of members of the People’s Mojahedin Organization of Iran (PMOI/MEK) in Camp Ashraf on September 1, 2013. Abbas Vaez-tabasi, dubbed the Sultan of Khorasan, is also is a member of the Expediency Council and the Assembly of Experts. He is also head of the Astan Quds Razavi, a conglomerate employing some 20,000 people which runs auto plants, agricultural businesses, and other enterprises and it is worth an estimated $15 billion. 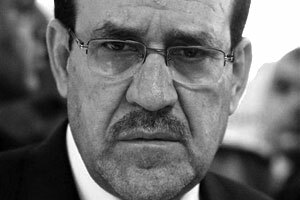 Vaez-tabasi welcomed Nouri al-Maliki and “expressed delight” in meeting before saying of the massacre and hostage-taking in Camp Ashraf: “I deem it necessary to express gratitude to you for your way of encountering the “Monafeqin” (regime’s derogatory terms in referring to PMOI (MEK) and its members and supporters). Monafeqin have been and are serving imperialism”, the state-run news agency IRNA reported on December 7, 2013.